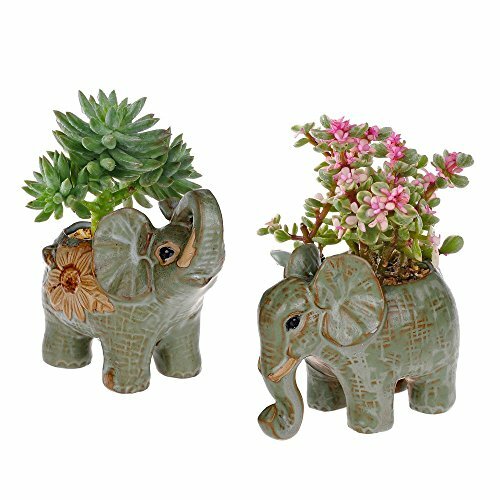 2 Pack Elephant Shaped Succulents Plants Pot Retro Glaze Ceramic Flower Pot Garden Yard Flower Succulent Bonsai Bed Trough Plant DIY Pot home desktop decoration by Supla at Tulips Orchids. MPN: 4316320406. Hurry! Limited time offer. Offer valid only while supplies last. Color as shown.Price for 2 elephant. This novelty flower pot was completely made by hand. It is handicraft, close to nature. The material is ceramic, fired by high temperature, and finally fully glazed. So, the quality is durable. Since it can be frost resistant, it can be used both indoor and outdoor. If you love simplicity and nature, our pot will be ideal for you.